The Northshire Cookbook Reading Group will meet on Wednesday January 14th at 6pm at The Inn At Manchester. The book we will be cooking from is: Make It Ahead by Ina Garten. Please pick up your reserved copy of this title (discounted 20%) at the bookstore and email Fran your chosen recipe. If you love to collect cookbooks, explore new recipes, cook and nosh on home prepared food in a group - this could be the reading experience for you! For more information about this reading group, please email Fran ftobia@northshire.com. 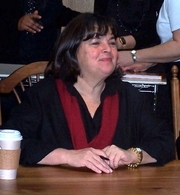 Ina Garten will be at The Grand on 2/19 for a signing of her Barefoot Contessa book, Foolproof. The discussion begins at 8pm and afterwards, she will sit down for an hour long signing. Pre-signed copies of the book will be available before and after the talk. We will have them available both before and after the presentation. More information on time will be coming soon. Ina Garten is currently considered a "single author." If one or more works are by a distinct, homonymous authors, go ahead and split the author. Ina Garten is composed of 3 names. You can examine and separate out names.